Before you run out to buy your first kit it's important to have a few tools on hand. Below is really the bare minimum you'll need to get a nice, clean, straight built kit. All the other fancy stuff is covered elsewhere on the Guide. Unless you're a 15 year-old me you'll want to do the smart thing and cut all your Gunpla pieces from the runners. 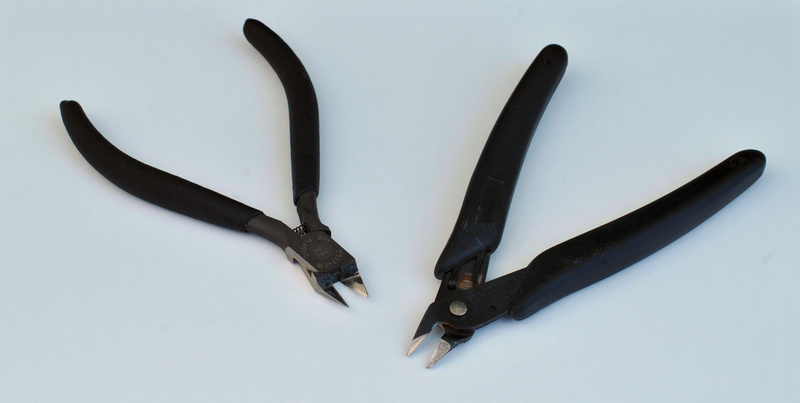 The easiest and safest way to do so is with a pair of hobby nippers (also known as hobby cutters or side cutters). Ranging from $10 to $80 (God Hand SPN-120 Ultimate Nipper 5.0) you should be able to find a pair at any hobby store and many online retailers. You're probably wondering, is the $30 pair better than the $10 pair? Well, short answer is, yes. Long answer, chances are you won't even notice the difference. The more expensive ones provide a much smoother cut, resulting in less plastic damage, but neither should cause any concern with proper technique (cut twice, one away from the piece, one flush, with sanding afterward). If you find yourself at a hardware store looking for cutters it's important to note the difference between hobby cutters and most general use cutters. Hobby cutters have feature a flush, flat edge on one side. This allows you to make a nice clean cut. General purpose cutters feature an angle on both sides. This makes for an easier cut but will still leave nubs on your kit. If you've got the confidence you may want to consider a hobby knife (think X-ACTO). Hobby knives provide a lot more flexibility and allow for closer cuts than even a pair of nippers. Knife blades may dull quicker than nippers but they're cheaper and easier to replace than nippers are to hone. However there are more dangers involved, like the risk of cutting yourself and cutting your surroundings. Trust me, it's incredibly easy to do. When cutting nubs from a part you also have to be careful you don't dig into the piece and take a bit of extra plastic along with the nub. Even if you don't remove the pieces with a knife it's always good to have one at hand. They're handy for removing stuck pieces and will be necessity if you decide to apply decals. Safety Tips: Always try to cut away from yourself. That way, if you slip, you're less likely to cut into yourself. Sometimes, however, you have to cut toward yourself in order to get a nice clean cut. Whichever direction, it's important to hold the piece you're cutting in such away that none of your fleshy bits are along path of your cut. If you're cutting downward be sure to do so with the aid of a proper cutting mat below! After you cut a piece from it's runner, and cut the rest of the nub off, there's always going to be a little bit left. You'll want to clean this with a bit of sandpaper. If you got a nice clean cut then you shouldn't need anything rougher than 600 grit to finish the job. If you're not able to get a clean cut then start with something with a bit more grit before smoothing it out with finer paper. Personally I use a fine metal file to get rid of my nub marks. The metal holds up where sandpaper will loose it's abrasiveness and will make quick work larger nubs. There are some large downsides to using a file though. It's extremely easy to take too much from a piece or slip and take a chunk out of something else. In addition most files have a flat surface making it difficult to use on a curved surface without flattening out a portion. Here sandpaper is the best bet, allowing you to work with the contours of the piece. If you decide to try out a file make sure to use one meant for fine detailing. Everything else will leave marks in the plastic. Perfect Grade kits, and certain older Mater Grades, have small screws. As do some Action Bases. If you're working on a project that needs a screw driver it's important that you don't use one with a small or fine head. 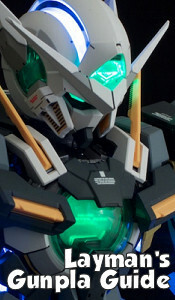 Bandai actually recommends you use a larger head to avoid stripping the head. Another way to put it: use your everyday screw driver, don't use something you'd repair eye glasses with.